Free Class On The History of Rock? Yes, please. 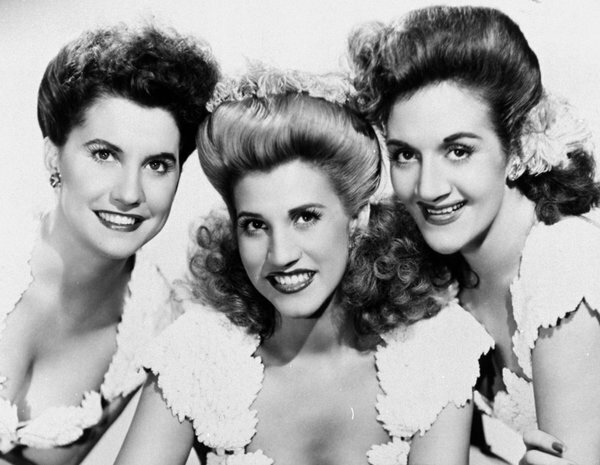 The Andrews Sisters were pioneers in the harmonization of vocals to emulate the new sounds coming from Big Bands in the late 1930s to early 1940s. Thank you, free online education. …so when I was working at Maryland, once a month I would shadow one of my Center’s social entrepreneurs in residence as they in turn advised students on ideas for new social enterprises (both for-profit and non-profit.) One in particular, my buddy Drew Bewick out of Treehouse Ventures in Northern Virginia, could not stop raving about this new website Coursera. Coursera, Drew told me a number of times, was a depot of 100% free online courses in every college subject imaginable from professors at universities all across the country. Free courses for now, which I suppose new ventures can get away with as long as they maintain the appropriate customer capture/adoption model. So yesterday after finishing up my requisite “apply for 2 jobs, e-mail 3 people about apartments, research the Seattle job market, clean Grant’s kitchen” kind of day, I figured why not and visited the website. On-line education is not a new phenomenon, and the revenue generation opportunities for universities are certainly inviting. However, what Coursera is getting right and what other current for-profit “e”-degrees are missing the mark on is the attractiveness of BOTP consumer opportunities. I’ve got my own separate opinions about whether online degrees are providing the same education as traditional residential degrees, but if the focus is on the education and retention of knowledge in packaged courses rather than comprehensive curricula, Coursera’s all over it. Anyways, check it. Or another course. It’s rad. On an unrelated note, I’m off Facebook until I get a full-time job and a place to live, or publish Hurricane Camp Stories. I’ll try to revitalize LTD posting and I’ll be tweeting more often from @golivos if you want to keep tabs. Day 58- still Seattle. This entry was posted in Music and tagged Andrews Sisters, Coursera, Les Paul, online education. Bookmark the permalink. 2 Responses to Free Class On The History of Rock? Yes, please. The Boswell sisters were the true pioneers, check me out! thanks for the coursera recommendations and also the shouts to my alma mater! I meant check ’em out.